This week we are spending our time in the Dordogne region of France. During the Hundred Years’ War (1336-1453), the French and the British battled it out for control of this area. Joan of Arc finally inspired the French to drive out the invaders and officially it has been theirs ever since. After a few days here, it is obvious what the fight was all about. More than any other region we have visited on our journey, this is undoubtably the most beautiful and desirable. It is lush and green and abundant with resources. One can easily understand why anyone would want to claim it. Indeed, the fight is not over. While the French have definitely been the owners of this territory for the past 600 years, the British have saved it. When the French could no longer maintain and make prosperous their small farms, the Brits bought them up and turned them into B & B’s and gîtes (with financial incentives from the the French government) welcoming everyone from around the world but most especially the English-speaking from the U.S., Australia, New Zealand, Canada, and of course, their native England. We have been the beneficiaries of this trend in our stay this week. Our hosts at Le Manoir des Granges, Paul & Philippa, are a British couple in their 50’s who bought several acres with 3 gîtes, a main house, and a house for themselves from an elderly couple who could no longer handle it about two years ago. They live here and this is now their life’s work. They have been extremely hospitable. We were welcomed on our first day with a bottle of wine and bowl of walnuts that were waiting for us in our gîte. Later in the week, they provided us with fresh-picked peaches from their orchard and scrumptious homemade walnut bread. For these and so many more reasons, we’d have to say we have enjoyed this stay more than any other on our journey. We began our visit with a trip to La Roque Saint-Christophe which is literally across the road from our gîte. We have a stunning, floodlit view of it every evening. This limestone cliff which towers 300 feet above the road and the Vézère River has been occupied by humans for the last 50,000 years from early man through Renaissance times. Stretching for more than half a mile, it consists of 5 terraces that show remains and recreations of all the necessary elements of a Medieval/Renaissance town — church, forge, smokehouse, individual houses, and various winches that were used to haul animals and products up the cliff side — all very interesting. The view of the river and valley below is breathtaking as well. The displays and explanations encountered as you walk along the terraces make it easy to envision what life must have been like in this sheltered haven. La Roque is one of dozens of prehistoric sites in this area which is not far from the famous Lascaux Caves, home to all those cave paintings you learned about in your social studies books. Later we ventured south along a twisty, green, forested route to Sarlat, a medieval town that was destined for abandonment and ruin in the 60’s until writer, resistance fighter, and politician, André Malraux came to its rescue. The town was restored and has become a center for tourists who visit the Dordogne. Interestingly, we learned from our hosts that many of the seemingly perfect medieval buildings are actually just façades with empty interiors which explains why we had a Disneyesque feeling as we sat with a coffee in the main town square. In fact, the town is so exclusively created for tourism that it closes up from October to March due to lack of business. One of the distinctive features of its architecture are the lauze roofs — flat limestone rocks gathered by farmers when clearing their fields and turned into cheap building material — a style which is now apparently unaffordable. With one town square dedicated to the trading of geese, it is not surprising to see more references to foie gras here than anywhere else. There are statues, murals, and paintings of geese. They adorn every object in sight and the number of stores offering goose rendered products such as foie gras are countless. From Sarlat, we followed a 27-mile scenic loop that encompassed some of the most beautiful and picturesque towns and landscapes of the region. First stop, a spectacular viewpoint just beyond Carsac. 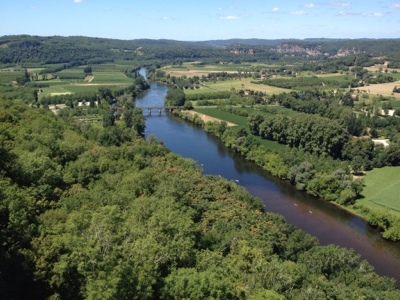 From atop the hill you can take in the entire valley officially known as Perigord Noir, or Black Perigord, named for all its walnut trees, one of several signature products including foie gras, truffles, cheeses, wines, and sausages. Next, my favorite stop of all, Domme, a tiny hilltop village with a breathtaking view of the Dordogne River and surrounding valley laid out in emerald greens and deep blues. We stopped here for our picnic lunch and along with the view, were entertained by some idle vendors who were playing a game of pétanque in between sales. For those who don’t know, pétanque is similar to Italy’s bocce and other such games in which the object is to throw or roll heavy balls as close as possible to a smaller target ball. It is extremely popular in France. Norman has been itching to play. After tearing ourselves away from this little paradise, we moved on to La Roque Gageac, another small, charming village with an interesting story. 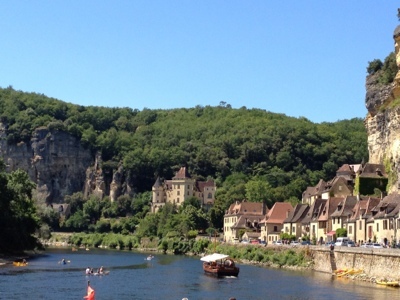 It’s a one street town carved into a cliff across from the Dordogne River. Every winter Gageac suffers an inundation than floods the first level of all the riverfront buildings causing them to be routinely vacated. In addition to a plethora of canoes, boats called gabarres ferry tourists up and down the river. They’re modeled after boats that used to carry local wine to Bordeaux and are recognizable to many as they were used in the movie Chocolat starring Johnny Depp. Braving more steep cobblestone paths, we wound our way almost to the top level and wondered how the locals managed to navigate these every day with their cars, shopping, and belongings while at the same time putting up with tourists constantly passing by and often peeking into their homes. The last designated stop on the trip was Beynac, yet one more perfectly preserved medieval stone village built on a hillside. At the height of the tourist season, these one street towns are just about impassable late in the day and we decided to simply take in the view from the windows of our car. Every one of these villages boasts its own castle — one more grandiose than the next. Some are privately owned and others are completely decked out in period furniture and antiques and open to the public. They are remnants of times past when noblemen used them to protect their families and control and defend surrounding territories. Time to get off the rocks and into the river! Canoeing is by far the most popular way to spend time on the water here. The Dordogne and its many tributaries provide ample opportunity. 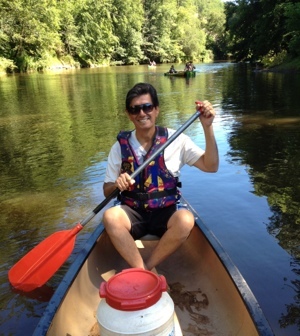 We rented a canoe and spent about three hours paddling down the lazy, smooth-flowing Vézère just beyond our gîte. The 7.5 mile trip allowed us to take in the scenery from a totally different perspective. It was spectacular to see the varied lush green vegetation rising up from the river on all sides and view the towering chateaus above us. All along the way we were accompanied by peacock-colored dragonflies skimming the water and occasionally landing on the bow of the canoe. We passed under three bridges and a number of cliff overhangs dressed in delicate ferns clinging to their undersides. At times it felt like we were on a ride at Disneyland, but it was all very real. Like the Brits who’ve come here for the beautiful countryside, warm climate, fine foods, and plentiful, high-quality wines, we’ve been captivated by what the French sometimes call “Dordogneshire”. I am certain we will be back very soon. Stay tuned for more Dordogne adventures as well as photos on a new link at the top of the page.